Last year was the fiftieth anniversary of C. B. Macpherson’s classic study of seventeenth century English political theory, The Political Theory of Possessive Individualism. Macpherson’s book signalled an important shift in the history of political thought; it sought to situate English political thought within the social context of a ‘possessive market society’. Despite its innovations, the book never really succeeded in producing a proper ‘social history’ of English political thought. Nonetheless, for those of us interested in interpreting the history of political thought within the context of social relations of power and exploitation, Macpherson has been a source of inspiration. This is the text of a talk that I delivered at a conference on Dominium and Property in the History of Political Thought at the Centre for the Study of the History of Political Thought at Queen Mary University in London last year. The article presents a sympathetic, yet critical examination of the strengths and weaknesses of Macpherson’s analysis and offers some methodological prescriptions in light of the criticisms of the possessive individualism thesis. Society becomes a lot of free equal individuals related to each other as proprietors of their own capacities and of what they have acquired by their exercise. Society consists of relations of exchange between proprietors. Political society becomes a calculated device for the protection of this property and for the maintenance of an orderly relation of exchange. This ‘possessive individualism’ leads to the creation of a “thin” bourgeois subject that is motivated by nothing other than narrow self-interest, and doctrines of morality and virtue become meaningless. In terms of the political theory of the period, all of the major contributions fall under this rubric of possessive individualism. The seventeenth century is characterized by a kind of bourgeois consensus that anticipates the Lockean liberal consensus articulated by Louis Hartz for eighteenth century America. The difference, of course, is that Macpherson’s possessive individualism reflects—yet obscures—the underlying class relations constitutive of England’s possessive market society. What is more, English political thought of the seventeenth century lays the foundation for the problems faced by nineteenth century British liberalism: namely, how to ensure social cohesion in a possessive market society in the context of the enfranchisement of the working class. Thus, Macpherson draws a lineage of ‘bourgeois’ political thought from the proto-liberal work of Hobbes to the bourgeois utilitarianism of Bentham. The differences between Hobbesian absolutism and materialism, Harringtonian republicanism, Leveller radicalism and Lockean liberalism are flattened out, and a line of continuity is drawn between them and Benthamite utilitarianism: all of these different forms of political thought are essentially different variations of an underlying political theory of possessive individualism. Macpherson’s critics are legion, and most aspects of his thesis of possessive individualism have been subject to substantive critiques. Indeed, the unpopularity of Macpherson’s work today fits within a larger context of the repudiation of ‘social interpretations’ of historical phenomena altogether, be they the great revolutions of the early modern and modern periods, or the development of ‘modern’ society, in either its bourgeois or capitalist manifestations. In general, attempts to situate political ideas within a social context have been associated with forms of ‘reductionism’, treating ideas as functional responses to underlying social forces that have no causal role to play in politics. I would like to assess two aspects of Macpherson’s work: his approach to historical contextualization in the history of political thought and his conceptualization of a seventeenth century England as a ‘possessive market society’. While both aspects of Macpherson’s work suffer from some serious shortcomings, the subsequent abandonment of a social history of political thought that eschews any attempt to situate political thought within a social context constituted by social property relations, is throwing the baby out with the bathwater. The problem with Macpherson’s work I argue, does not inherently stem from a general attempt to relate the development of seventeenth century political theory to its social context, but rather, from his attempt to define the relationship between capitalism and political theory as an ontological one based on what he considers to be the essential subjective criteria derived from an abstractly defined possessive market society. This is a problem because, as I argue below, the seventeenth century remains a period of social transition that is best understood empirically and historically; one in which intellectual constructs and discourses were contested and re-articulated. More specifically, it is the way in which Macpherson attempts to socially contextualize seventeenth century political thought and the way he characterizes his possessive market society that is the fundamental problem. His approach to the issue of capitalism and political thought ultimately leads him to subordinate a variety of different contributions to seventeenth political discourse to the totalizing rubric of ‘possessive individualism.’ Establishing an essentialist relationship between the political theory of possessive individualism and capitalism opens him up for the severe criticism levelled at him by his critics: breaking the link denies the relationship, thereby necessitating the abandonment of any social interpretation of political thought. Macpherson’s approach to historical context seeks to relate political thought to the tacit ‘social assumptions’ of the author, assumptions that were shared with the intended audience but were never explicitly elaborated in the text. In order to uncover the real meaning of a text, therefore, an historical analysis of the relationship between prevailing ideological assumptions and the social relations of that society is necessary. Meaning, therefore, cannot be understood solely in terms of references to the text itself. At the time, at least within the North American context of political theory, this was a rather provocative statement to make, as the ‘history’ of political thought firmly ensconced within the sub-field of political theory, which defined itself increasingly in relation to the discipline of political philosophy and largely dismissed the significance of history. Macpherson’s claim that the persuasiveness of a political argument does not rely solely on logic—and that the standards of ‘logic’ must also be subject to historicization—but rather on the ability to tap into unstated social assumptions that are necessarily historically specific, was a significant challenge to those who believed that the meaning of political theory is intrinsic to the text itself. The question remains: how do we excavate the unstated assumptions upon which this approach to contextualization depends? Macpherson provides us with some insights. The first two conditions are necessary but insufficient for imputing to a theorist a particular social assumption. The first is that it was a common assumption of the period to the extent that the theorist feels that it does not need to be explicitly stated, or that it has become a kind of ‘common sense’ to the point that he is unconscious of holding that assumption (of course, how we ascertain whether something has attained the status of ‘common sense’ is not sufficiently addressed). The second is that it fills a logical gap in the argument, thereby reconciling a contradiction or redressing an incoherent sequence of argumentation. But these two conditions are not enough; the third condition is that the social assumption is ‘mentioned or used by the writer in some context other than the one in which we think it is required’. Yet, Macpherson never successfully articulated or executed an historical approach to contextualization. The Political Theory of Possessive Individualism contains little in the way of methodological guidelines; there is no real discussion of the significance of history, nor is there any discussion of the historical method as a tool of interpretation. Indeed, there is very little discussion of how to go about excavating the tacit ‘social assumptions’ that are so crucial to interpreting the text. While the last condition of Macpherson’s criteria may require straightforward methods of research (e.g., assessing the entire corpus of a political theorist and subjecting them to rigorous analytical critique), it remains unclear how we go about ascertaining whether a social assumption is in fact commonly held within a particular historical period. To be able to identify a social assumption requires us to engage in the kind of historical contextualization that allows us to construct a body of meaning that is shared by the relevant audience. It needs to be evidence based. At the very least, this requires the kind of intellectual history conducted by proponents of the so-called ‘Cambridge School.’ Without an understanding of the dominant intellectual context, we cannot know what social assumptions are common enough to be assumptions in the first place. This kind of intellectual contextualization is lacking in Macpherson’s work. The problem with emphasising the importance of unstated assumptions as the basis of the context lies precisely in the fact that they are unstated: an absence of evidence is not enough to disprove the connection between the theory and the assumption, and the argument relies largely on the strength of the logic employed to make the argument in the first place. Ironically, Macpherson falls victim to the same kind of problem that applies to the esoteric method of Strauss: the lack of empirical evidence proves the existence of the hidden meaning, and in the end, we are convinced on the basis of the persuasiveness of the logic as opposed to the evidence. Indeed, one of the problems with Macpherson’s method of contextualization—to which I will return below—is that it relies for its context on a self-acknowledged ideal type of a possessive market society that precludes our ability to establish any concrete relationships between the political thought being studied and that social context. One of the virtues of Skinner’s methodological forays of the late 60s and early 70s was to emphasize the importance, not of the unstated assumptions of political theorists or the hidden meaning in their text, but rather of the stated intentions of the authors themselves. More problematically, however, is the idea that a political theory can be rendered coherent or complete by reference to an un-stated social assumption. Filling in the gaps and addressing the ‘silences’ of a political theorist’s work can be a very problematic methodological precept and result in the creation of associations that cannot be supported by the evidence. This is a point that was initially made by Skinner. To presume an overarching coherence to a political theorist’s work is—in a sense—to imply that their work is immune to the contingent political conflicts and developments of their own time; it is to imply a certain detachment that an historical approach to contextualization is meant to reject. Having said all this, I think there is something significant in the attempt to historicize political thought within a social context as opposed to merely an intellectual context. Those who sympathize with Macpherson’s work remain convinced that—despite the problems of the thesis itself—there is value in attempting to relate the meaning of political theory to a larger social context defined by social relationships that form an integral part of the relations of power that are constitutive of politics in any particular society. The task, however, is to articulate and practice an approach to contextualization that doesn’t collapse political thought into the social in ways that are reductionist. Thus, a more historically informed approach to social contextualization needs to go further beyond the text than Macpherson is willing to go: it needs to establish evidence-based linkages between the ideas being articulated and the social processes at work within the social context. This is no small feat, and will be discussed further in the final section. The second aspect of Macpherson’s work I want to discuss is his conceptualization of a ‘possessive market society’ as the requisite context of seventeenth century English political thought. Macpherson characterized England as a “possessive market society,” distinguishing it—on the basis of a number of significant factors—from what he called a “status” or “customary” society on the one hand, and a “simple market society” on the other. A customary society is characterized by a number of factors that make it antithetical to a modern, possessive market society: all producers are tied to the land; labour—and the rewards stemming from labour—is authoritatively allocated on the basis of status; and absolute and unconditional rights to private property are absent from the economy, preventing the development of a market in land. A simple market economy—while possessing some of the necessary conditions for the development of a possessive market economy—is not sufficient for its development and existence; it remains a society dominated by petty commodity producers who remain in possession or ownership of their own means of subsistence despite the fact that their economic activity is oriented towards the market. In other words, while a simple market economy is characterized by a market in goods, it lacks a market in land and labour. In contrast to this, a possessive market society is characterized by the full development of markets in land and labour, thereby resulting in the polarization of society along the lines of owners of capital and owners of labour power. Thus, the existence of proletarianization is a key factor in defining the nature of a possessive market society. Given this presumption, Macpherson then argues that English society—being a possessive market society—was primarily divided along class lines that pitted a class of proletarianized wage-labourers (constituting the majority) against the small class of capitalists. In the context of this possessive market society, a number of social assumptions are then prevalent amongst the elite. First, that the labour of the wage-labourer is not rightly considered to be his property despite the prevalence of conceptions of self-propriety. Secondly, that the working class lacks the rational capacity to make informed political decisions that allow them to be considered part of the body politic. Given that wage-labourers are dependent on the wills of others as a means of selling their labour power in return for the wages necessary to procure their means of subsistence, they cannot be said to be ‘free’ in the sense articulated in the discourse of self-propriety prevalent in the seventeenth century. These social assumptions about labour and the labouring class are identical to those shared by nineteenth century liberals writing within the context of the development of industrial capitalism and constitute the most enduring problem of liberalism. The significance of this is that the possessive market society—despite Macpherson’s allusions to the contrary—is depicted in rather static terms and is divorced from the politics of the period. The glossing over of the differences between Marx’s and Weber’s accounts of the development of capitalism removes from the picture the profound social and political struggles that were bound up with the transition to capitalism—both at the level of class conflict between landlords and peasants and at the level of intra-class conflict between members of the landed class itself. For Weber, the development of ‘modern’ capitalism resulted from the development of a particular ethic peculiar to forms of Puritanism; it resulted in a particular kind of attitude towards time, work and reward, one that rested on a religiously inspired form of asceticism. For Marx, the origin of capitalism was an intrinsically violent process entailing the dispossession of the peasantry. This history, Marx wrote in Capital, ‘the history of their [the peasants] expropriation, is written in the annals of mankind in letters of blood and fire.’ Thus, despite seventeenth century England being a century characterized by a civil war, two revolutions and persistent forms of social conflict over landed property in the form of enclosures, none of these play a prominent role in Macpherson’s model of a possessive market society. The bracketing off from the analysis of the actual social struggles and power relations bound up with the development of capitalism leads Macpherson to attempt to define the relationship between capitalism and political theory as an ontological one, based on what he considers to be the essential criteria of an abstractly defined possessive market society. As mentioned above, Macpherson underscored the significance of conceptions of ‘self-propriety’ or ‘self-ownership’ as the foundation for this market conception of man. This conception of self-propriety enjoyed a dual status in Macpherson’s thesis: it could exist either as an independent postulate, or it could be deduced from two other propositions—namely that one’s ‘humanity’ stems from ‘freedom from dependence on the wills of others’ which subsequently entails a conception of freedom defined in terms of engagement in voluntary relations out of self-interest. From this basis, Macpherson makes a number of theoretical moves. First, he suggests that conceptions of freedom as independence, voluntary self-interest, self-propriety and the freedom to alienate one’s labour are all contained—explicitly or implicitly—within a conception of society as a ‘series of market relations’. The ‘concept of market relations necessarily implies individual freedom as defined in terms of voluntary self-interest,’ conceptions of self-propriety and alienable labour; and finally, the ‘postulate that human society consists of market relations necessarily implies that an individual’s humanity is a function of his freedom’ as independence from the wills of others. The second move is therefore to reduce morality to a function of market relations. This approach to the issue of capitalism and political theory ultimately leads him to subordinate a variety of different contributions to the history of seventeenth century English political thought under the totalizing rubric of ‘possessive individualism.’ Establishing an essentialist relationship between the political theory of possessive individualism and capitalism opens him up for the severe criticism levelled at him by his critics: and breaking the link between the two denies the relationship, thereby necessitating the abandonment of any social interpretation of political thought. For example, the inclusion of the idea of freedom as independence from the will of others into the notion of possessive individualism neglects to take into account the contested nature of ‘independence.’ Freedom as independence need not imply the bourgeois notion of being free to voluntarily pursue one’s own interest; it is also perfectly compatible with oligarchic notions of ‘republicanism’ that can trace their lineage back to Roman antiquity and are perfectly compatible with the existence of a traditional landowning aristocracy. But freedom as independence also has a place in the popular struggles of peasants against the exploitation of that very same landowning aristocracy; the idea of being free from dependent forms of labour—be it corvée labour, labour services stemming from ‘servile tenures’ and even wage-labour—has a long tradition dating back to the Athenian democracy. Indeed, the ideological significance of the social struggles between peasants seeking their freedom and the landlords attempting to maintain their dominance over those very peasants was noted by Rodney Hilton—the Marxist social historian of the medieval period—as a key development in the history of English conceptions of freedom. This approach to the issue of capitalism and political theory also leads Macpherson to downplay certain aspects of seventeenth century political thought that do not fit the model of possessive individualism or that may indeed be antithetical to the ‘bourgeois’ society that it represents. For example, the emphasis that Macpherson places on the role of individualistic notions of self-interest at the expense of civic minded values leads him to downplay the enduring significance of conceptions of virtue and ‘manners’ as an antidote to vice and corruption. As Pocock demonstrates, there exists within seventeenth century English political thought a political language rooted in the civic humanism of Renaissance republicanism that exalts the civic mindedness of the virtuous citizen acting in the interests of the common good often against his own interest. Not only is this not a manifestation of possessive individualism, it is, according to Pocock, fundamentally anti-bourgeois. There is also a sense in which, as James Tully has pointed out, the thesis of possessive individualism ‘misidentifies the primary problems’ that were being addressed by seventeenth century English theorists. Even if we accept that aspects of Macpherson’s possessive market society were reflective of English society in the seventeenth century, it is not necessarily the case that the political theorists of Macpherson’s study were primarily concerned with the socio-economic problems identified by him (e.g., Hobbes and obligation in a capitalist society, Locke and unlimited accumulation, etc.). Reliance on an abstract model of a possessive market society as opposed to an historical examination of English society leads Macpherson to focus on particular problems that may not have been of primary concern amongst theorists of the time. By overstating the extent to which capitalism had developed in the seventeenth century (as well as the ways in which it developed), Macpherson may have been throwing up the wrong issues—or, to put it more accurately, framing the issues in the wrong way. As historians working within the Cambridge tradition have demonstrated, it is more often the case that seventeenth century political theorists were concerned with political problems that were thrown up by more contingent and immediately identifiable political crises such as the Civil War, the Regicide, the Engagement Controversy of the Revolution, the Protectorate, the Restoration, the Exclusion Crisis and the Glorious Revolution. To say this, however, is not to suggest that these political events are disconnected from a broader social context. To do so would be to embrace what one scholar has referred to as an ‘episodic’ conception of history, in which a series of contingent political events exist independently of any notion of long term socio-historical processes of development. This is the task of a renewed social interpretation: connecting the social to the political in a way in which the former forms part of the context in non-reductionist, and non-teleological ways. However, sympathetic critics of Macpherson have sought to further pursue the importance of the development of capitalism on the character of seventeenth century English political thought. I would argue that despite all of the flaws, Macpherson was right to emphasise the importance of the development of something we would today identify as ‘capitalism’ to the development of seventeenth century English political theory. As Gordon Schochet once wrote, Macpherson was ‘almost right—but not at all for the right reasons.’ The task then, is to move beyond Macpherson while working within the broad themes that motivated his work. To start with, the entry point needs to be reframed: it is not a matter of attempting to demonstrate how unstated bourgeois assumptions illuminate the political thought of the period, but rather, raising a number of questions that treats both capitalist development and political theorizing as historical and politically contested phenomena. The questions become: how did capitalism develop as a form of socio-economic organization? How did it engender new forms of social conflict? How did the struggles around this development result in the re-articulation of pre-existing concepts and discourses as well as the introduction of new concepts and discourses? Can we then identify what is ideologically requisite for the development and reproduction of capitalism? The point is that we do need a conceptualization of capitalist development—as the relevant social context—that is not just ‘sufficient or appropriate for general sociological or historical analysis’, but the product of sociological and historical analysis, if we are to engage in the kind of social interpretation of the history of political thought proposed by Macpherson. It is here that I would like to conclude with some suggestions as to how to reinvigorate a social interpretation of (English) political thought after the methodological challenge of the so-called Cambridge School. 1. First, any method of historical contextualization must be evidence based, building on the intentions of the authors. Un-stated assumptions must be rejected as being unverifiable and potentially dangerously misleading. Political associations between political theorists and relevant ideological movements must be established through historical and biographical research. The same must be said for conceptualizing the social context: the use of ideal types constructed from a variety of different theoretical sources is not a sufficient method of historical contextualization. Rather, an engagement with social history is necessary if we are to have a more accurate picture of the complexity of the social context as well as its conflictual nature. 2. Secondly, building on the first point, historical contextualization must treat mediating political institutions (such as the state) and social conflicts as constitutive of the context of social relations. It is not enough to treat them merely as a backdrop, as contingent events that serve to motivate the writing of political thought; nor is it acceptable to neglect them outright as Macpherson tends to do. The point is to conceptualize a social context that brings together political institutions, social conflicts and social property relations in a way that emphasizes their interrelationships. 3. Thirdly, and this pertains specifically to the way Macpherson approached the phenomenon of capitalism and its relationship to political thought, we must avoid the tendency to conceptualize capitalism at the ontological level, which then necessitates certain essentializing conceptions of the self that become identified as defining aspects of a bourgeois ideology. Macpherson tends to deduce the meaning of English political thought from unstated social assumptions that are reflective of a fully formed bourgeois subjectivity that precludes an analysis based on the fact that capitalism, as a form of social organization, emerged out of an open-ended process of social conflict and struggle. The bourgeois subject is the result of these struggles. 4. Fourthly, and at a more general level, an attempt to relate English political thought to the development of capitalism must reject the ‘bourgeois paradigm’ and the forms of political thought that have been associated with its ascent to dominance. 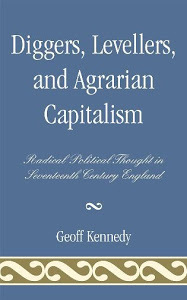 In the case of England, the agrarian origins of capitalism and its relationship to the economic transformation of a section of the landed aristocracy needs to be taken into account, along with the implications this has for the development of possessive individualist conceptions of society and the self; the persistence of traditional conceptions of moral conduct, personal virtue, etc. and its compatibility with aristocratic forms of agrarian capitalism. This is not the appropriate place to discuss the debates regarding the agrarian capitalism thesis; the point to be highlighted is that the development of capitalism occurred not through a displacement of the aristocracy and landed property, but rather through the transformation of a significant fraction of the aristocracy and the transformation of the social property relations existing between these landlords, their tenant farmers and the growing class of wage-labourers that came to work the land. What this means for any attempt to situate English political thought within a social context of capitalism is that it rejects the association of capitalist development with the rise to dominance of a classic ‘bourgeoisie’ and the subsequent association of capitalism with ‘liberal’ or ‘proto-liberal’ notions of political thought. Rather, it accommodates the development of an ‘aristocratic capitalism’ that can more effectively allow for the persistence of aristocratic values and an aristocratic culture that has remained dominant in English political culture up to the present day (not to mention the persistent importance of landed property within English political thought). At an empirical level, then, it can more effectively account for the fact that ‘bourgeois political economy’ did not supplant moral philosophy, but rather supplemented it, insofar as the classic contributions to moral philosophy were often penned by the same authors who broke new ground in political economy.